Under the new federal Constitution, the First Congress had the momentous job of creating the laws to govern the various branches of the new government, whether setting up the framework for executive departments such as Treasury and State, establishing its own rules and schedule, or, in this case, creating a federal court system. In its second session (January 4, 1790 through August 12, 1790) Congress passed the Crimes Act, which defined a plethora of federal crimes, punishments, and court procedures. Here in the third session, the Congress provides a schedule of compensation for officers and jurors, as well as a process for scheduling and meeting places for the various federal district courts around the new nation. FIRST CONGRESS. [THOMAS JEFFERSON]. 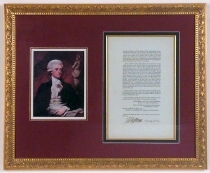 Printed Document Signed as Secretary of State. An Act providing compensations for the officers of the Judicial Courts of the United States, and for Jurors and Witnesses, and for other purposes. New York, N.Y., March 3, 1791. 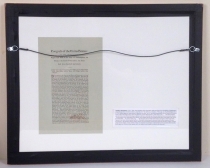 Signed in type by George Washington as President, Frederick Augustus Muhlenberg as Speaker of the House of Representatives, and John Adams as Vice President, and president of the Senate. 2 pp., 9 x 15 in. This act from the early days of the federal legal system under the new Constitution shows Congress deciding how to reimburse the participants of the courts. The U.S. Attorney is granted traveling expenses of “ten cents per mile going, and the same allowance for returning.” The clerk of the District Court shall receive a salary of five dollars per day; the clerk of the Supreme Court gets eight dollars a day. Jurors are to receive 50 cents a day, plus 50 cents traveling expenses for every ten miles. Fees for marshals, process servers, even witnesses are specified. “There shall also be paid to the marshal, the amount of the expense for fuel, candles and other reasonable contingencies for holding a court.” The Act covers only the federal District Courts for New Hampshire, Massachusetts, Rhode Island, Connecticut, New York, and Virginia and specifies which cities shall house the court: Portsmouth and Exeter in New Hampshire; Boston, Newport and Providence, Rhode Island, Hartford and New Haven, Connecticut, New York, and Richmond, Virginia. Following a law passed on September 15, 1789, Thomas Jefferson, as Secretary of State, signed two copies of each law, order, vote, or resolution of Congress for distribution to the executive of every state. At the time this resolution was passed, Vermont was a single day from statehood (March 4, 1791), so it is very likely that just 28 copies were signed by Jefferson to be sent to the states.